"Black and tan with good male appearance. Nicely developed fore-assembly and rear. He moved with balanced coordination and masculine authority while maintaining a good topline. He was a total package, a completely mature male standing. On the move he was balanced with a full coordinated functional strong gait, while maintaining a nice outline. I feel that this dog is what our Standard calls for in males. I am pleased that he went on to Select under Mr. Newton." "This was the Winners Dog. He is a very nice male, properly proportioned with good substance. He presents a pleasing profile posed and in motion and is a very good mover. This is a quality male who is a litter brother to the Number 2 Select Dog (Pinebuck's Kidd Carson). It is good to see two such outstanding dogs from the same breeding." "What a correct dog he is! Balanced, fliud, steady movement on a loose lead. This is a dog that could win on either side of the Atlantic. Masculine but not overdone. Proper convergence coming and going. He showed great work ethics and was in the peak of condition. George Berstler handled him so smoothly and never interfered with a wonderful package. Unfortunately, as the gaiting progressed he did not use his rear quite as well as the first dog." "Ch. Wayside's Honky Tonk Man is a very correct dog that is very hard to fault in any area. He moves with great balance and did not take a wrong step the entire time. He is masculine, clean going and coming and displays impeccable character. He was in tope condition and was shown to perfection. 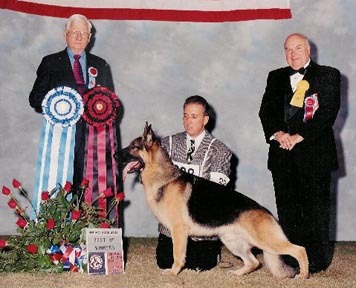 He is a dog that can be shown in any ring and win -- a great ambassador for the Breed."